In another installment of major retail closures, Sears Holdings announced that it will close an additional 46 Sears and Kmart locations this fall. This came on the heels of Lowe’s announcement that it intends to close all Orchard Supply Hardware store locations by early next year. The Sears and Kmart stores are scattered throughout the country while Orchard Supply’s 99 locations are concentrated in California, Oregon, and Florida. All told, that’s a lot of large retail space that’s about to be vacant…how will those spaces be adapted? The housing and community development sector is looking in the rearview mirror as it tries to tackle the affordability and opportunity challenges that face millions of Americans – and it is about to have a head-on collision with an autonomous vehicle. As we work to address the 7-million unit housing shortage in the U.S. and enable people to live where they have access to good-paying jobs and high-quality schools, we need to look beyond the bricks and sticks, amortizations, and tax credits and start figuring out how self-driving cars and a whole suite of mobility, data, and communications-related technologies are about to transform how and where we live and the implications that will have for low-income people and communities. The combination of technology and data applications being applied in urban environments, loosely referred to as “The Smart City,” has initiated a slew of policy and planning work in cities and regions across the country that provide an opportunity to shape an inclusive and equitable future for lower-income citizens and communities. New technology-enabled forms of mobility are the biggest driver of urban transformation. Until recently, options for getting from point A to point B (too far to just walk) were limited: privately owned car, taxi, and public transportation (bus or subway). But the onset of the shared economy, enabled by digital technology and ubiquitous mobile devices and high bandwidth networks, has introduced a nascent multi-modal network that includes options such as shared private cars, e-bikes, e-scooters, shared pedal-powered bikes, and soon autonomous cars and buses. As we continue to try to build our way out of the affordability shortage, we need to do it in the context of what the market will look like over the next decade and beyond. If people can move more efficiently, at lower cost, and on-demand throughout a city, what implication does that have for how real estate is used and valued and how affordable housing is produced, preserved, and allocated? Is location in the city core or in a high-resourced neighborhood as valuable if the access or proximity to that place is not as distant or isolated as it previously was? What does transit-oriented development mean when the transit network becomes dynamic, on-demand, and comes to wherever you are? While we don’t have a crystal ball that tells us what cities will look like 10 years from now, we do know that technology will continue to be more pervasive, less expensive to deploy, and generate some unexpected (and maybe unintended) outcomes. Identifying and applying core principles that derive greater equity, inclusion, and social and economic justice in our society will help steer us to better outcomes regardless of what technologies get deployed. Put People First: Especially as cities plan and design transportation systems and make zoning decisions that dictate where new housing can be built and its density, these decisions must be made in the context of how people actually live and what resources they have. There has to be a balance between what we want to see and the reality of how life plays out, especially for those lacking resources. How do we help unhoused and underhoused people find permanent housing that also enables a commute to a job in less than 30 minutes? How do we help the senior citizen living alone in need of some light assistance but not appropriate for a nursing home and not able to afford an assisted living facility? How do we keep the child connected to her network of social supports where she has grown up? We must make the systems we build, both digital and analog, fit people’s lives and not build to suit the technology’s capability just because we can. Solve Problems, Don’t Search for Them: So many technology applications seem to be solutions in search of a problem to solve. Yet the problems in the social sector are right in front of our faces: affordable housing, quality education, access to fresh food, living wage jobs, climate change, and mobility. If cities define their problems well and ask companies to bring their best solutions regardless of technology or analog function or preference, then we are likely to get better outcomes than asking for a specific technology to do X, Y, or Z. If we lead with problem-solving, then we will evolve to a city of meaning, purpose, and justice. If we lead with technology, then we are likely to end up with a dystopia. Get the infrastructure right: Infrastructure, especially hard infrastructure that requires rights of way (roads, bridges, water/sewer, fixed rail) is extremely expensive and only gets built and rebuilt once every few generations. Decisions we make today will likely last upwards of a century. But some infrastructures, such as transportation and power are becoming more flexible and dynamic, less constrained. As cities face decisions today on critical infrastructure projects, they need to consider how needs will change over the next decades especially regarding technological and climate change influences. That means running scenarios for multiple futures and determining how any given investment will respond. It also means testing for resiliency and how infrastructure can withstand and adapt to changing climate and market conditions. Rigorously measure outputs and assess externalities: As solutions are put in place, outputs should be measured in real time and routinely evaluated. These metrics need to be considered and structured for in advance. Assessments for externalities need to be conducted to ensure that unanticipated costs or problems are not being generated. Open the process to citizens: Governments should view citizens as their partners, not just customers. As Smart Cities evolve and produce immense volumes of data, those data sets should be made public in real-time so citizens can help identify problems and generate solution options. Imagine the creativity and brainpower that could be unlocked if people were invited to participate in making their communities as great as possible. Rather than viewing government as something to tolerate and where citizens are essentially passive consumers of government services, rules, and regulations, we could start to shift to a partnership model where citizens felt empowered to bring solutions as well as complaints. Let’s collectively flag down that big self-driving bus barreling down on us and hop on board. It and the other emerging Smart City technologies can help redefine what is possible for a more equitable, prosperous, just, healthy and sustainable society. It may also help us solve the housing affordability challenge. While much has been said about the impact autonomous vehicles could have on the demand for parking, less has been said about what to do with the parking we have now, or what we should do with parking that has yet to be built. Parking can be split into three categories: street parking, surface lots, and parking structures. Street parking is addressed mostly through road diets in speculative pieces, and surface lots are equally easy to use as a flat, blank slate to be reinvented into something else. But what about parking structures? Parking structures are both a challenge and an opportunity for innovative architects. They’re concrete structures with blocky columns, sloped floors, ramps between floors, irregular ceiling heights, and awkward floor plans. None of these attributes make them ideal to remodel and given the uncertainty regarding how much parking we’ll need in coming years cities may feel hesitant to take action just yet. However, this is not a ubiquitous opinion. A few cities have been recognized for plans to turn parking lots into other uses; while not as difficult to do as parking structures, it demonstrates that cities aren’t thinking they need as much parking as they have on hand. Eventually, more articles will be written about converting parking structures into affordable housing, office space, or other uses. Here is an example of a proposed parking garage in Seattle that is convertible to residential space. For existing parking structures, remodeling their husk into a new use could be difficult and expensive, but not impossible. Here is an example of a difficult space – an abandoned subway restroom – being turned into a home by a British architect, and here a very skinny corner parcel in Japan was turned into an apartment building. These are not spaces that are considered prime real estate for redevelopment; they are not large spaces, they have funky shapes to work with, and most people would consider it a difficult endeavor to convert the space to something new and useful. But, if we can build apartments in geometrically restrictive triangles and dilapidated public restrooms, surely a rectangular, multi-story building in the heart of downtown shouldn’t be an insurmountable challenge? Parking spaces could be narrower, since passengers are likely to be dropped off at their destination and never set foot in the parking garage itself, cars won’t need the space to open doors. Aisles could be narrower as well because AVs drive more precisely. Parking spaces and aisles will likely both change sizes to reflect the size of vehicles, which might be stratified into a floor for traditional looking cars (personal use) or for rectangular shuttles (transit storage). Parking garages could use charging capabilities, and could possibly incorporate car wash stations. Loading lines could maximize efficiency and eliminate aisles. Assuming all cars in a garage are automated, instead of the traditional layout of singular rows with aisles in-between, loading lines without space between cars or aisles could be used for maximum efficiency (this would work for shared cars in which the car at the front of the line can be deployed for any rider). Allow for natural lighting. The cars won’t appreciate it, but future tenants will. A concept can be found here. Although autonomous vehicles aren’t here yet, widespread adoption of ride-hailing services has already seen to decreased revenues for parking lots and garages. Parking lots are being bought and repurposed by developers in large quantities. Green Street Advisors, a California based real estate research firm, projects that parking needs in the US will be cut in half over the next 30 years due to a combination of ride-hailing and autonomous vehicles. It’s time to make plans for our changing parking needs, both from the effects we’re seeing today and the effects we’ll experience soon. Jenna Whitney is a Master’s Candidate in Community and Regional Planning and an Urbanism Next Fellow at the University of Oregon. She is examining how cities are planning for a multimodal future in the era of autonomous vehicles. That’s what some Amazon Prime members in Austin, Cincinnati, Dallas, and Virginia Beach might be saying today after Amazon announced that it will begin offering free two-hour grocery delivery from Whole Foods. As you might recall, Amazon rocked the grocery world when it announced it was purchasing the upscale grocery chain in August last year. 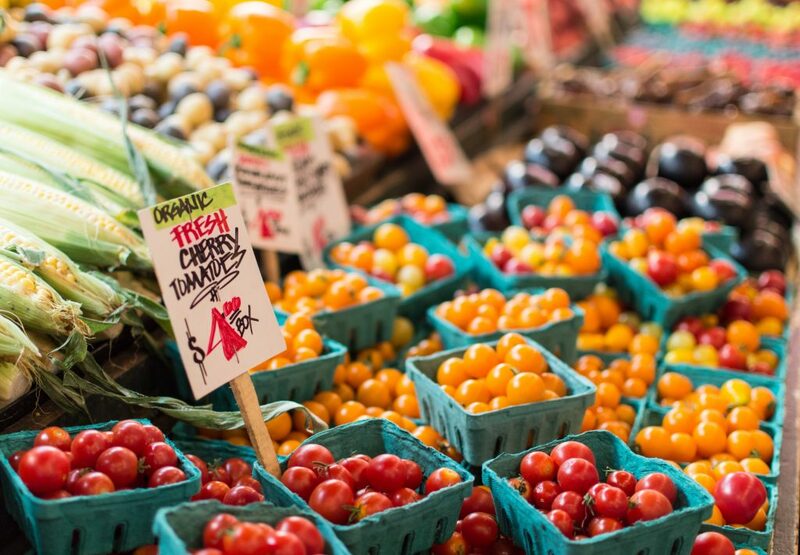 Now, some customers will have the option of ordering natural and organic products from their local Whole Foods store and having it all delivered for FREE within two hours. According toBloomberg Technology, 90% of Amazon Prime’s 90 million users live within 10 miles of a Whole Foods, so the announcement of a free delivery service perhaps should come as no surprise. And from a cost standpoint, you can see how this would pencil out—instead of pulling items off a shelf in some distant warehouse that then have to be transported to local destinations, goods will come directly from a nearby store right to your doorstep. This convenience does not come without implications, of course. For one thing, we could see an uptick in delivery traffic in the cities where this program is rolling out. (Did I mention that delivery is FREE?) Increased delivery traffic could result in increased congestion, particularly in dense areas, as drivers look for loading zones or possibly double park to drop off orders. (Even more reason why cities need to start digitizing those curbs.) There’s also the question of what this will do to suppliers. As Bloomberg’s Olivia Zaleski mentions, shelf space at Whole Foods could get a whole lot more expensive as suppliers compete for placement. And then there’s the competition that other grocery stores will experience–just this week, the Portland-based upscale grocery chain New Seasons announced that it will be closing a Sunnyvale, CA store it opened less than a year ago and will not be building the other California stores it had planned. They cited “growing pressure from new business models, including stores offering in-store pick-up of online orders and meal kit delivery services” as contributing to the decision. Imagine how much tougher it could get for them now that a direct competitor for their retail market can offer fast and free delivery. Let us not overlook the equity implications of this announcement either. If you can afford an Amazon Prime account, you likely live within 10 miles of a Whole Foods, as noted above. 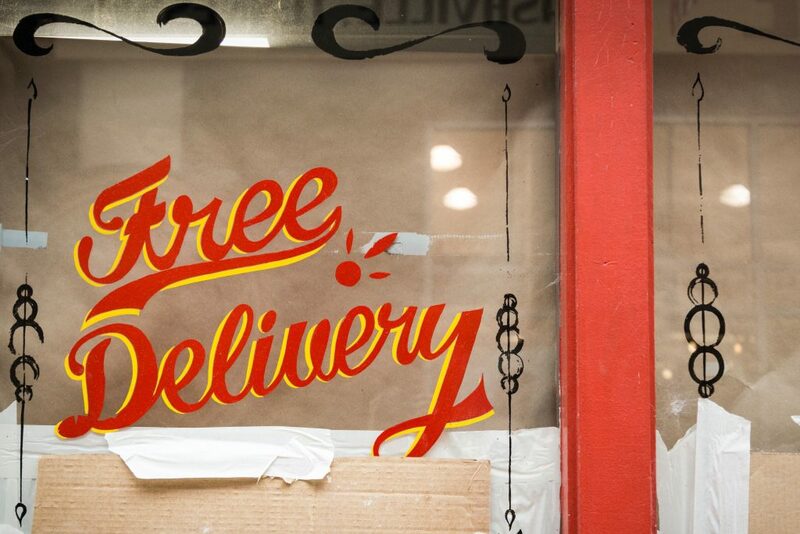 Now you can get free delivery of fresh, organic foods. But what if you can’t afford an Amazon Prime account? 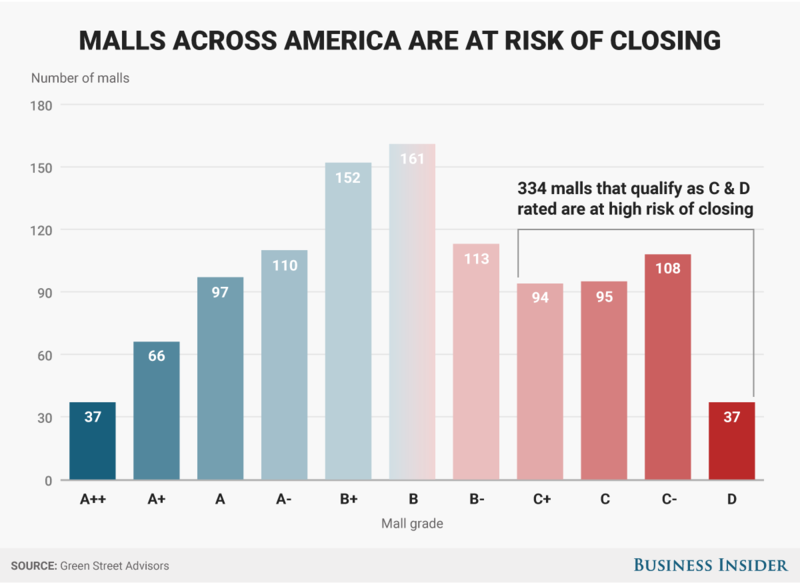 E-commerce promises convenience, and perhaps no other company understands “that the most important value in American retail today is what’s is technically known as ‘consumer convenience'” than Amazon. But convenience comes with a price tag that many people cannot afford. How do we move into the future without widening the gaps between haves- and have-nots even more? Join us for discussions about the equity implications of emerging technologies and what to do about them at the Urbanism Next Conference next month! We have been asked numerous times about how the introduction of AVs (and E-commerce) might affect streets. As cities make plans for future expansions, changes to their street network, the inclusion of various modes/complete streets, and overall street design – what should they be considering when they include thinking about AVs? Curbside space allocation for pick-up and drop-off – This will become a large issue as demand for this space will increase substantially – especially at peak travel times. It could also cause significant disruption to transit and bike networks as AVs compete for curbside access and cut across bike and transit lanes. E-Commerce Delivery – Similar to above, as e-commerce expands, there will demand for curb space and places to temporarily park vehicles as deliveries are made. In addition, we will probably be seeing a large increase in delivery vehicles (an expansion of a specific kind of freight) which will affect streets and corridors? Separation of Modes – As AVs have algorithms that don’t allow them to hit people (a fantastic development), a corollary will be that anyone walking or biking in the street can cause mass disruptions to the transportation network. A “critical mass ride” of one. This had led to calls for stronger separation between modes – a disastrous proposal – imagine our streets starting to look like China’s where there are fences between modes. Drones on Streets – Not the flying kind (those are probably further off in the future) but the terrestrial ones. Picture an Amazon truck parking in a neighborhood and sending off twenty delivery AV rovers. Will those drive in the street? On the sidewalk? How will they affect other modes? What should we suggest or try to regulate? Micro Transit Corridors – Lyft and Uber are pushing shared rides (Lyft-Line and Uber Pool) and are already incentivizing people to make their pick-up and drop-offs happen along arterials or more heavily travelled routes to reduce the vehicles efficiency (see this earlier post). This will define micro-transit routes throughout the city. Where will these be? Should cities help define the routes? How will it affect all modes moving through these areas? Reduction/Elimination of Parking – We are already seeing a reduction of parking use in some venues as Lyft and Uber takeoff (see this earlier post, and this one). As this happens more and more – research says we will need 10-15% of current parking spaces – what happens to the onstreet parking? Is it transferred to other modes or additional lanes? What happens to the buffering role it currently plays in many streets? Changes to Available ROW – Building on this last point, if AVs need narrower lanes (they are better drivers than we are) and potentially can increase throughput through some streets (see point on this below) and therefore allow a reduction in necessary lanes – how will we use the available ROW. This is especially critical as available ROW seems to be one of the larger limitations to increasing dedicated infrastructure for transit, bikes, and pedestrians. Increase in VMT – Most modeling of AVs we have seen show an increase in VMT, but this is more dramatic in scenarios where we all have our own vehicles vs shared fleets. This is especially so if we don’t tax empty cars (zombie cars) driving around as they wait for their owner or go do errands on their own. How will this increased VMT affect other modes, congestion, etc? How can we make sure we limit it? Efficiency of Streets (for cars) – AVs in theory will be more efficient, require less space and be able to move faster. Many models have been created that show connected vehicles zooming towards each other at intersections and just barely missing as they efficiently move people and goods. What this fails to recognize is that one of the larger impediments to this type of free-flow movement is the fact that multiple users exist in the right-of-way. Pedestrians and bikes would not work well in these scenarios. This leads to thinking that there may be two worlds of cars on streets – those where they dominate (definitely freeways, but will that also start including arterials and collectors…) with free flow of vehicles and other areas where other modes are considered as well. Will the mixing of modes be frowned upon because it is such a limitation to this efficiency? Will some areas ban bikes/peds? Street as a Utility – This is more of a meta-concept, but the idea is that we need to stop thinking of the street as a public space that we can all use whenever and however we want, but instead should think of it as a utility that has limited capacity. Related to how we pay for the amount and time of our electricity use (in places), we can think of streets similarly. This might lead to something like a geometry tax (you are charged for how much space you take up on the roadway divided by the number of people in the vehicle – a great deterrent to zombie cars). — Stay tuned for an upcoming post focused on this topic! Finance – We have done a quick pass at how these technologies will be affecting municipal revenues and – in short – it will not be pretty or easy (see our report here and see analysis of parking/car related revenue impacts here). A lot of disruption (for example the drastic reduction of parking fees and traffic tickets while we are needing to pay for retraining large groups of the population who used to work in retail or driving jobs). Limited budgets will affect everything else government tries to do and services it provides – streets included. Writing software to navigate the driving characteristics, challenges, and rules of cities around the world is clearly a challenge. Some in the automobile industry are nudging the US Department of Transportation to develop more specific policies for AVs. Transportation Secretary Elaine Chao has indicated that a new set of voluntary guidelines will be issued by the end of 2018—though they will remain voluntary. Much of current the current talk of AV policy has surrounded the technical aspects of AVs—with very little attention paid to the secondary effects of AVs. Faculty, staff, and students with Urbanism Next are taking this gap in attention seriously. We will be releasing one of the first looks at secondary effects on local government budgets (expenditures and revenues) later this month. AVs are going to be a global phenomenon, thus adaptation to AVs will take on many forms and we are now at the moment in time where we have the potential to have the most impact on how cities adapt or shape their future with AVs. Drone delivery is on the horizon and could take a bit off the edge of the congestion cliff that will come with increased AV use and increased E-commerce. 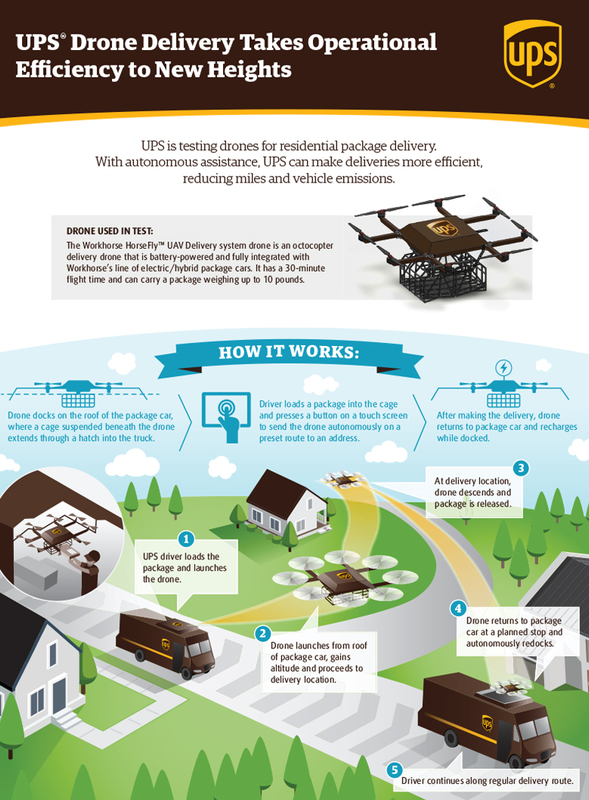 UPS just tested a delivery model where a drone, attached to the top of a truck, can deploy to deliver a package while the driver continues on to do their own delivery at another site. Some large caveats exist with the ability to use this in urban areas (as opposed to the rural example they describe). That said, this is one step closer to the package delivery model where trucks become mini-distribution hubs and a fleet of drones go to and from a parked vehicle. Obvious implications for trip generation, for potential design changes to buildings (say hello to your new rooftop mailbox! ), and for distribution of warehouses in cities. Graphic of how this would all work is below. For anyone who has tried to re-purpose municipal parking into something else, it is likely they have faced resistance due to lost revenue. And with projections of autonomous vehicle adoption significantly reducing the need for parking, what will a city do? According to a recent report by Morgan Stanley, the answer is: make more money. They estimate that the introduction of autonomous vehicles will generate a half trillion dollars for municipal budgets, offset by only $1.3 billion from lost revenue such as parking fees and fuel taxes. This and other recent reports on some interesting ways to think of how municipal resources could be re-allocated for better and higher uses, such as reducing from 42% the amount of time police officers spend on issuing traffic citations, can be seen in this article in Governing. Due to this consolidation, the size of facilities is greatly increasing – ‘First Mile’ facilities (these are distributions centers that are first accepting parcels from suppliers) greater than 1 million square feet are becoming more commonplace. — Picture a single facility as large as 4-5 New York City blocks or 16-20 Portland blocks. ‘Last Mile’ facilities (distribution centers that ship directly to customers) – on the other hand are locating in order to shorten and speed up final deliveries. This is leading to smaller distribution centers (50-75,000 square feet) scattered around urban areas. A great graphic that shows the complexity of new shopping and delivery methods is below. Many forms of delivery and each has its own land use and transportation implications.